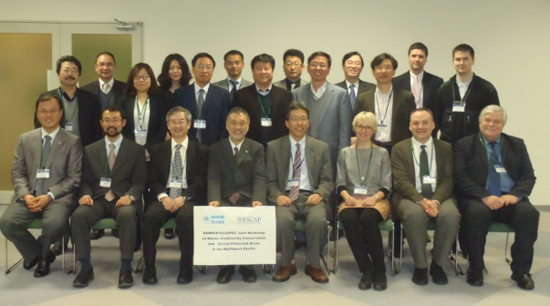 NEASPEC and NOWPAP jointly organized the Workshop on Marine Biodiversity Conservation and Marine Protected Areas in the Northwest Pacific on 13-14 March 2013 in Toyama, Japan. The Workshop brought together national focal points of the Network and experts from China, Japan, Republic of Korea and the Russian Federation, and international marine programmes including the Helsinki Commission (HELCOM), the North Pacific Marine Science Organization (PICES) and IOC Sub-Commission for the Western Pacific (WESTPAC). The Workshop on the first day led by NOWPAP focused on the status of MPAs and future plans for conservation of marine biodiversity, and current status and challenges of assessing marine environment for marine biodiversity conservation. The second day led by NEASPEC focused on MPAs and potential areas of subregional cooperation, and programme and operational modality of North-East Asia MPA Network.